Just because you are going out with your baby and you are now officially a mom does not mean that you have to look less fashionable and elegant. You need not trudge around the mall, carrying an unexciting and tasteless bag stuffed with your baby’s clothes, diapers, and milk bottles. Rather, you can go for modish designer diaper bags fit for a stylish mom like you! When it comes to diaper bags for a stylish mom, you will have to check out both the style and function. You cannot just turn any bag into a diaper bag. It should still have the necessary pockets and organizers as well as a folded and flat diaper-changer incorporated inside. However, the overall appearance should suit your fashion style and look fantastic with different outfits. 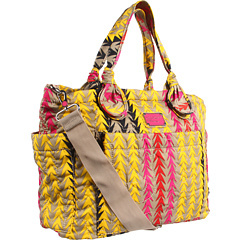 This finely crafted diaper bag has an adorable printed fabric with matching stylish handles. There are also slip pockets, and the storage area is big enough too to hold the bottles, snacks, wipes, diapers, and other things of your baby. A wide, adjustable strap is also added for convenience. What’s great about it also is the cute and cheerful combination of colors and patterns, along with the embroidered lettering. When you carry this around, you will not only modish but will also give off the impression of a fun-loving and happy mom. Who would have thought that a stylish and posh-looking tote bag like this is actually a baby bag? This bag is spacious enough to fit the various items of your baby. It is made of easy-to-clean synthetic brushed leather, with a very beautiful design in black color and gold trimmings. The inside is lined with nylon, made with built-in multi-functional slip pockets. 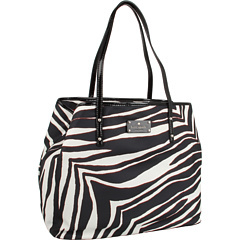 This diaper bag will surely turn heads when you use it. It is also available in light brown and pewter colors. This bag, though doesn’t look like a diaper bag at all, carries everything you need for your baby at a moment’s notice. It is made of coated canvas and comes with a changing pad for on-the-go help. The open top is convenient for a quick access to baby essentials, and flat bottom with hardware feet protects bag when set down. 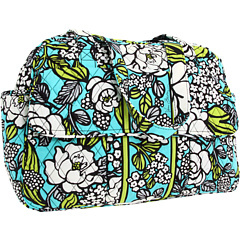 This printed diaper bag done in an Island Blooms theme is perfect for summer use or for vacation travels. Created with a beautiful quilted cotton fabric, dual straps, pockets on all sides, a flat bottom, and a matching changing pad, a lot of moms will surely love this bag and find it comfy enough to bring to different places. It is also available in other prints and color schemes such as Safari Sunset, Rhythm and Blues, Floral Nightingale, Tea Garden, Happy Snails, and Viva La Vera. Such design is certainly a great pick for trendy moms who are always on the go! With these options for trendy designer diaper bags, a stylish mom like you will definitely find great satisfaction and joy bringing such along. You need not lose your fashion sense by carrying a baby bag around. These examples exhibit well this fact as they emanate fun, style, and confidence in a mom. This entry was posted in Bags, For Moms and tagged best diaper bag, best diaper bags, designer diaper bag, designer diaper bags, diaper bag, diaper bags, timi and leslie diaper bag, timi and leslie diaper bags. Bookmark the permalink. not so grand, February 25, 2011I got this based on the reviews. it looks like a very surdty bag. Not sure where all the pockets on the inside are (based on a review) the bag is big enough too big for my taste. i was hoping to find A diaper bag that wasnt so diaper bagish.The brown is a lot lighter then the picture displays. the straps are not adjustable but seem to be of a good quality. not sure how one review will use the outside pocket as her purse, (another reason i bought this to illiminate bags) the outside pocket is only secure with a snap and not big enough to hold a wallet. maybe some cards (but again its only closed with a snap)not what i was looking for but its a nice bag, I will return it for something a bit smaller with more purse type qualities because lets face it.. the diaper bag is the new purse for a very long time.